After having been criticized for his initial reaction to the Cambridge Analytica affair, in which he acknowledged his company’s responsibility in protecting user data but stopped short of actually apologizing, Facebook’s CEO Mark Zuckerberg took out full-page ads in several major newspapers on Sunday to make up for it. “We have a responsibility to protect your information. If we can’t, we don’t deserve it”, the ad opens, repeating a statement that Zuckerberg had already made last week. Only this time it leads to an actual apology. "This was a breach of trust, and I’m sorry we didn’t do more at the time”, the statement continues, referring to the harvesting of millions of Facebook users’ data in 2014 and the company’s idleness after learning about it. While Facebook promises to take better care of its users’ data going forward, many commentators rightfully point out that what happened, collecting user data and using the information to target ads to people, is Facebook’s business model in a nutshell. “Data misuse is a feature, not a bug”, Ethan Zuckerman writes for The Atlantic, only in this case it wasn’t used to sell people the right shoes but to manipulate their political views and stir division. 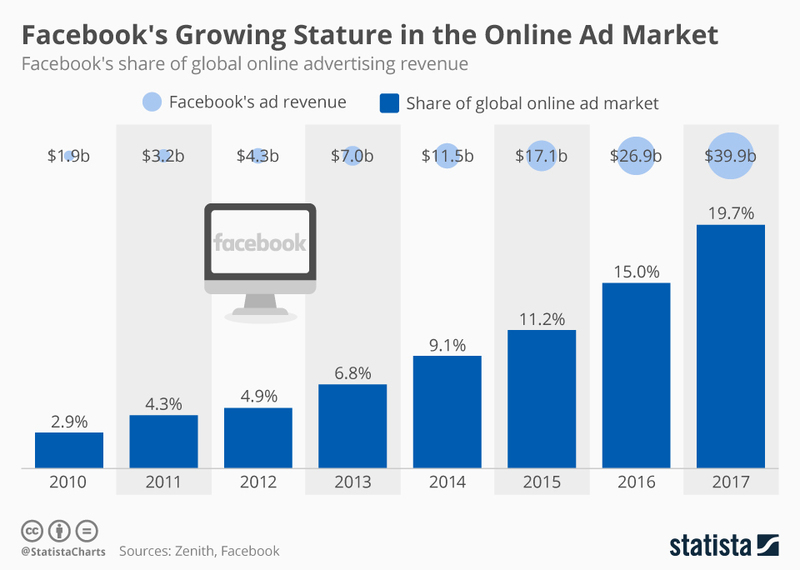 As the following chart illustrates, Facebook has had tremendous success selling personalized ads over the past few years. In 2017, the company accounted for 20 percent of the global online advertising market, second only to Google, arguably the one company sitting on an even larger trove of personal data. It will be interesting to see how the current debate affects Facebook’s advertising business in the long run. The company’s shareholders are certainly worried: Facebook’s share price dropped nearly 20 percent over the past ten days.